Wow, this week of Mommy School was a struggle! Both Little Man and I are recovering from the flu, and I had a serious lack of energy! With Mr. Oopsey Daisy traveling the entire week, I needed to be on my A-game as a temporary "single" parent. I wasn't quite the All-Star Mommy Teacher I wanted to be. I took lots of breaks to lay down on the couch. 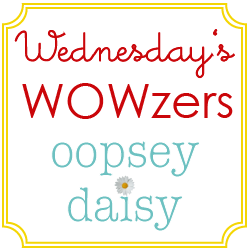 I have declared next week of Mommy School a review week, so I plan to use the time to catch up and review everything we have covered so far! Nonetheless, come along with me on our week's adventure! You can download my week plan if you find that helpful. I am still trying to find the best way to show, in just 1 measly lil' blog post, everything we're working on! I think from now on, I will focus on showing our theme activities. Just keep in mind we are learning number skills, colors, shapes, and lots of letter sounds, too! It's just a whole lot to document each week! 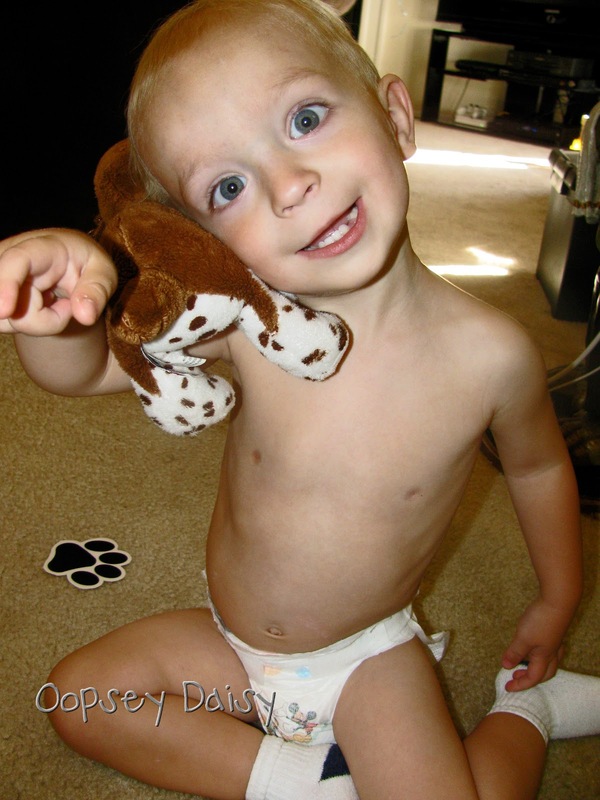 * Little Man has a photo book full of pictures of dogs. He loves looking through them. We sang the song "How Much Is That Doggie In the Window?" and took turns selecting a dog photo and putting it up in the window with each verse. * We visited our local pet store. Little Man selected one he wanted to hold, and we gave it lots and lots of love! 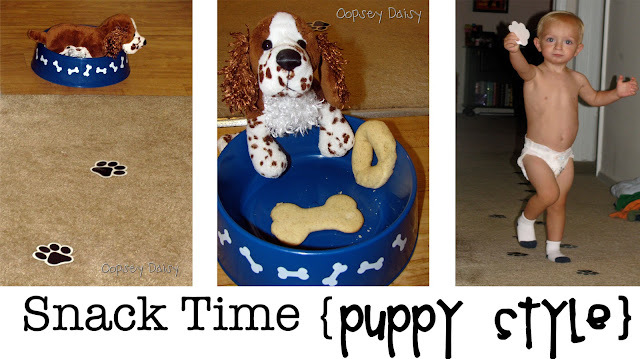 * Every day when Little Man woke up from his nap, I had set up a trail of puppy paw prints from his room to a dollar-store doggy dish with his snack. It was like a little treasure hunt! * Little Man loved gathering up the paw prints! 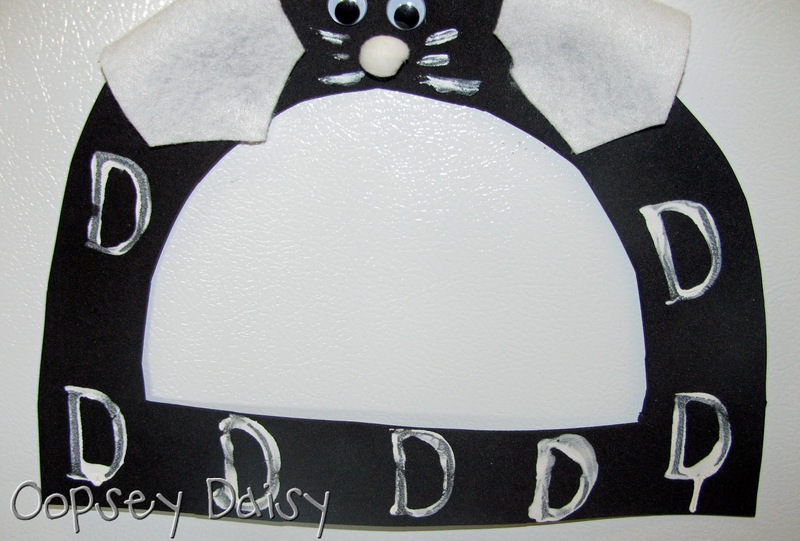 * We made bone-shaped sugar cookies along with D-shaped cookies. They made yummy snacks! 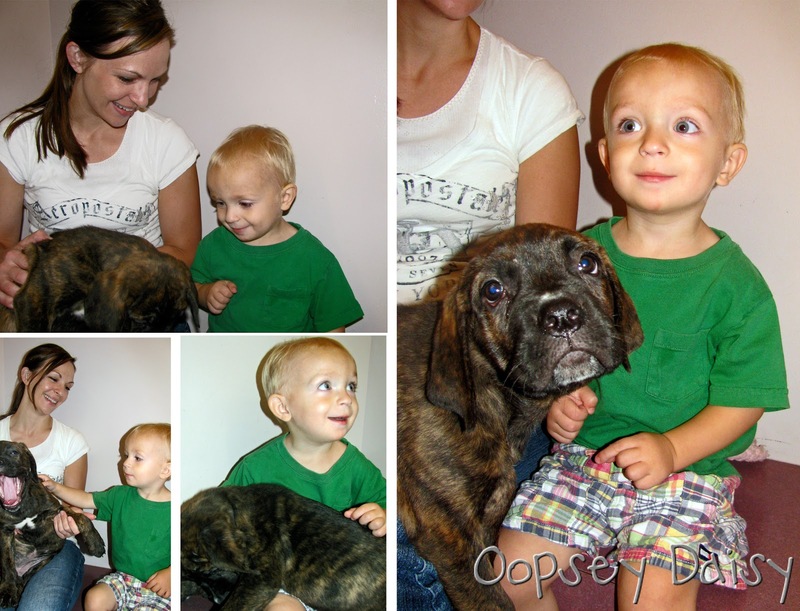 Little Man became very attached to his little puppy dog throughout the week! We practiced pet care by giving this little puppy a bath! * We created a D out of black foam. We stamped D's all over it. Then we used white felt to create the ears, folded them over, and glued them. A few google eyes and white-out whiskers! * We dug for doggy bones in the sand box. We used the Milk-bone snacks that are already bone-shaped and buried them and uncovered them in the sand. We used a dump truck to load and unload the bones. 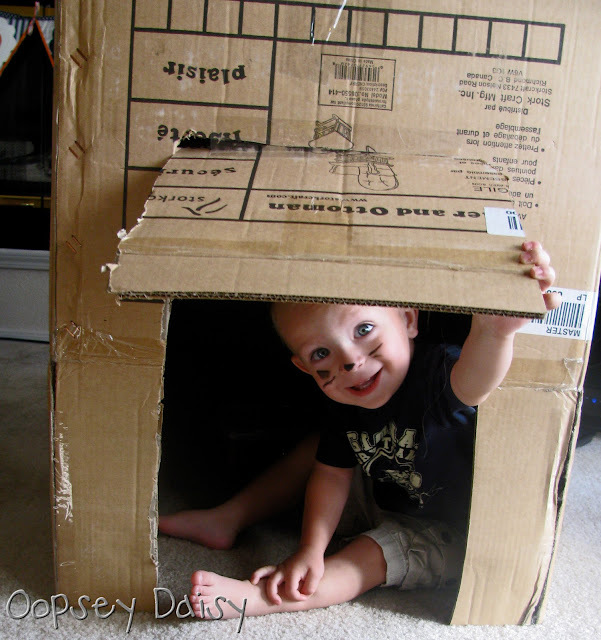 * We made a little dog house out of a cardboard box. We had big plans to paint this, but the flu changed those plans! We used face crayons to draw a nose and freckles on our faces. * Little Man ate his snack in his dog house and loved crawling in and out of it! 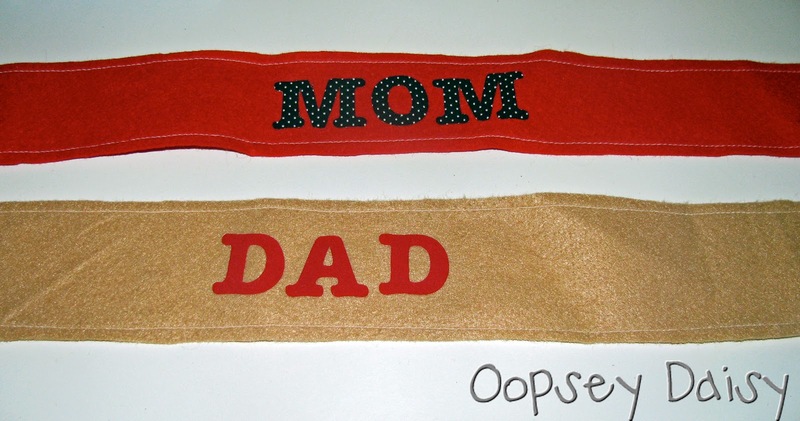 * I made felt dog collars for each member of the family. 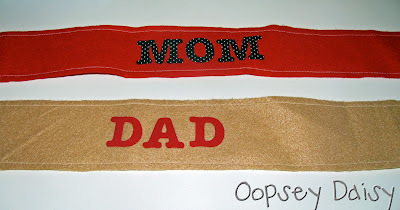 I just sewed velcro on each end and sewed all the way around the collars to give them a tailored look. I ironed on the letters for our names. 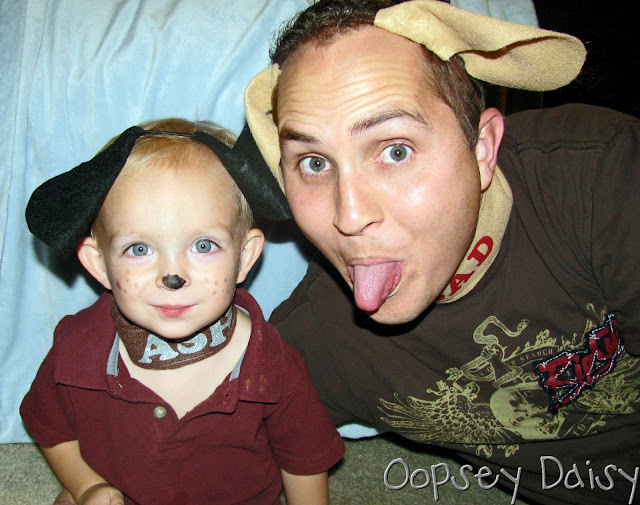 * I made doggy ears by hot gluing felt ears onto headbands. Are my boys cute or what?! * We read this classic story and decided to make the story become alive! We gave his stuffed animal dog a bath... just like Harry! * Also, we painted this clean and dirty version of the Harry dogs. We used dog treats (the Milk Bone version that look like bones!) to paint the dogs. 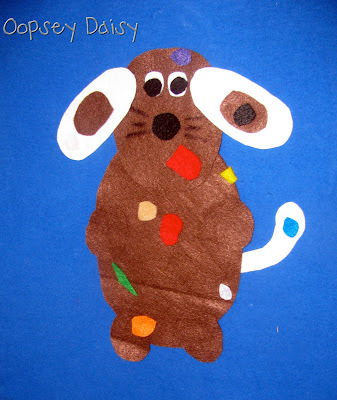 I am proud to say that this is Little Man's very first art project all on his own. YAY! * We also watched the video of Harry the Dirty Dog. 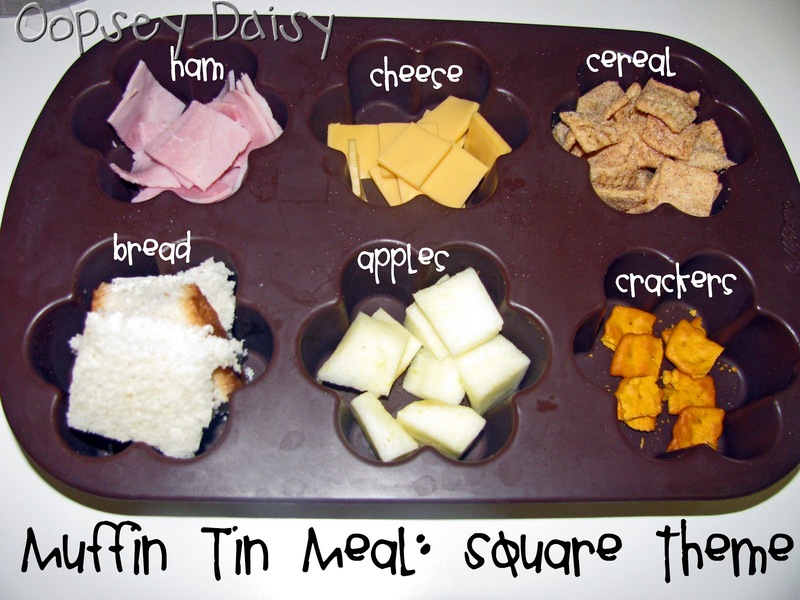 * We made Harry snacks! 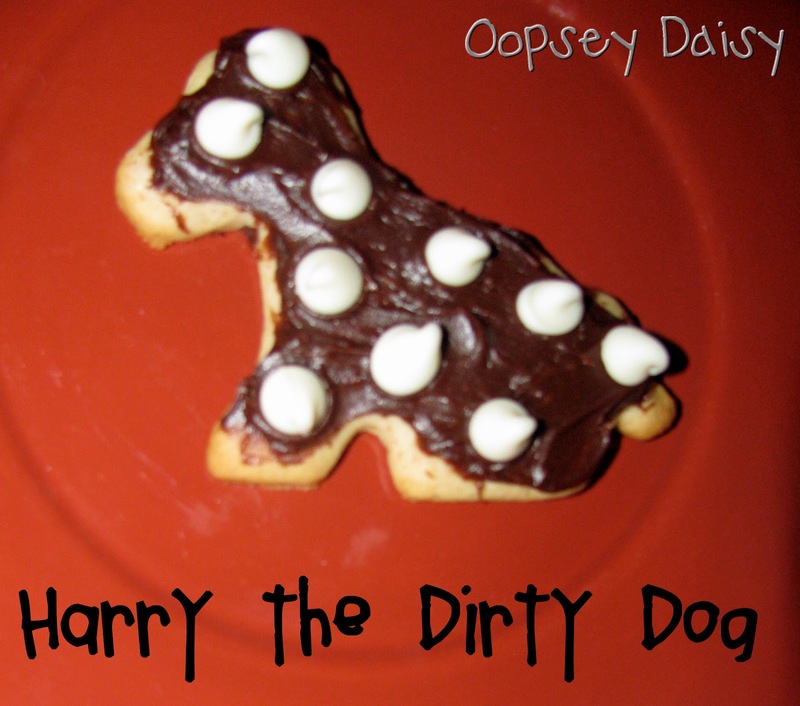 This is the dirty dog version... he is now black with white spots! Little Man loved this! * Most of all, I wanted Little Man to see numbers. 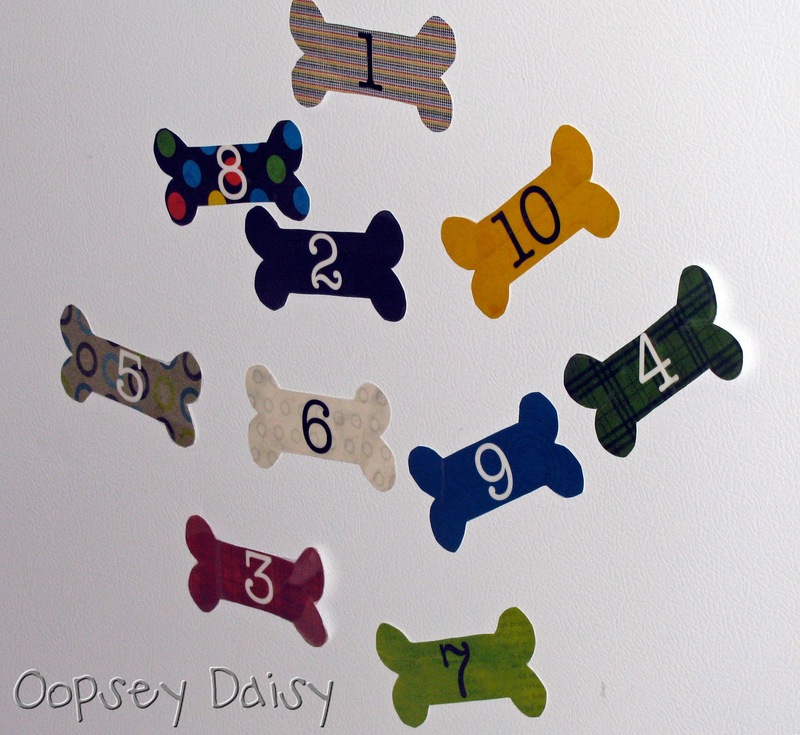 We made these dog bone magnets for him to manipulate on the fridge and also practiced putting them in order. We paid particular attention to the number one. * We also played a doggy counting game. Just like the owl counting cards from last week, we had dog counting cards. We placed the correct number of paper bones to match the dog. * We used a grid counting game to learn one-to-one correspondence. We put chocolate chips or paper bones on top of dogs in a grid as we counted. 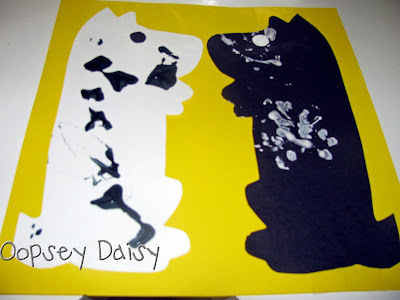 * We studied the number one by covering a large numeral one with doggy stickers. * I found the story here. I just re-typed it up and used my felt scraps to create the visual aids. Little Man LOVED this story! * You can find a fun printable for this story here. We were studying squares this week, so we cut everything into squares for his muffin tin meal! * Harry the Dirty Dog by Gene Zion. * How Much Is That Doggie In the Window? by Iza Trapani. * Dog's Colorful Day by Emma Dodd. * Officer Buckle and Gloria by Peggy Rathmann. * I Got Two Dogs by John Lithgow. * McDuff series by Rosemary Wells. * Spot series by Eric Hill. I loved dog week, but I am also looking forward to our review week to give me a bit of a break! Enjoy your weekend! Not sure if it is just me, but on this post, the pictures aren't opening. The post below this one, they do so I'm wondering if it is something to do with the pics?? 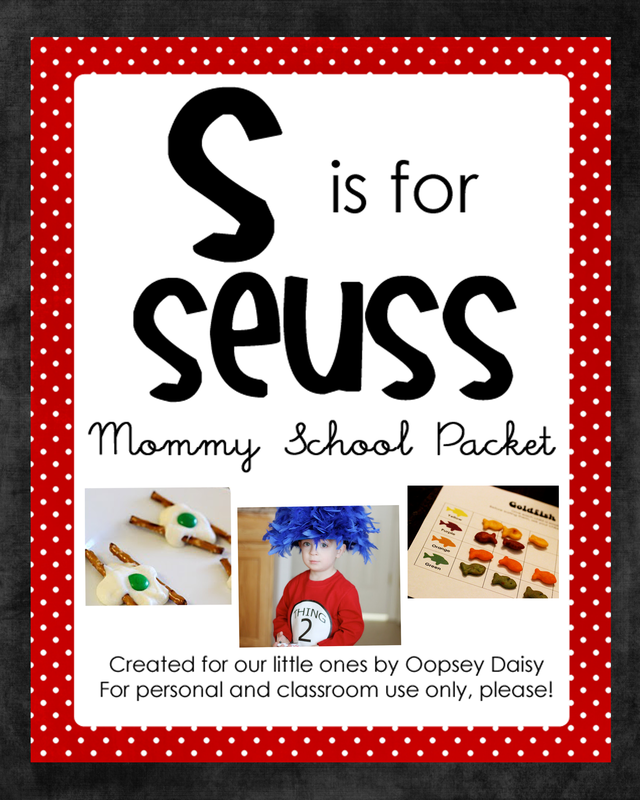 I think this is the most fun Mommy School week yet! The puppy you two picked out to show some love is adorable. I hope you both are starting to feel better!! Can I just say that you are such a great mom. Your weekly plan is pretty amazing. Hey and we made those GC bingo sheets and used them today. They were a big hit. Thanks! Wow-all this while you were sick! 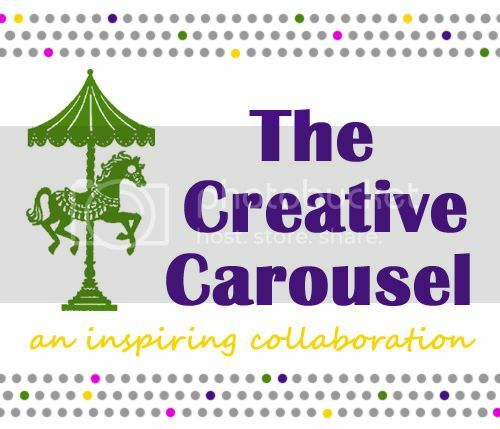 You plan themes like I do-looking forward to reading more of your blog! 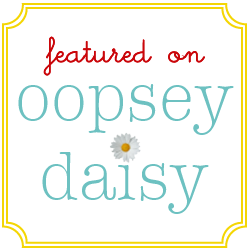 I am so glad i have come across your blog! your Mommy School is one of the most wonderful ideas I have ever seen 🙂 I love what you do and create. Do you do this all in one week? Also, I love this idea and am saving it for the future, but do you have any tips for babies? I currently have a 3 month old baby and would love somthing like this to do now. Either way I am your newest follower 🙂 Thank you so much for sharing! I’m going to be doing a “Go Dog Go” school’s starting party/school unit for my 2 tots and their 2 cousins in the beginning of September! These ideas are AWESOME! They will come in very handy! Thanks so much! I LOVE mommy school!!!! Ive been looking for something to use as a guide to teach my little girl. She wont be able to start school until shes 6yrs old and shes dieing to go but shes only 3:( im also a stay at home mommy so this gives us fun learning things to do together and she can feel as if shes in “school” i just reall enjoy the website and greatly thank you for doing this for people like me. Happy holidays to you and your family!! Wow. Thank-you for the free downloads and suggestions for other sites. The MakeLearningFun website is great. Thank-you so much for the guidance. My son is only 6 months old, but I’m so happy to find there are resources available for when he’s ready to start learning. Thanks again and great work! Wow! You do more sick than I do healthy! I am so glad I stumbled on your site! Thank you for sharing so many wonderful ideas!!!!!! Mommy school rocks!! !